After spending the while evening programming I have finnally made some progress. 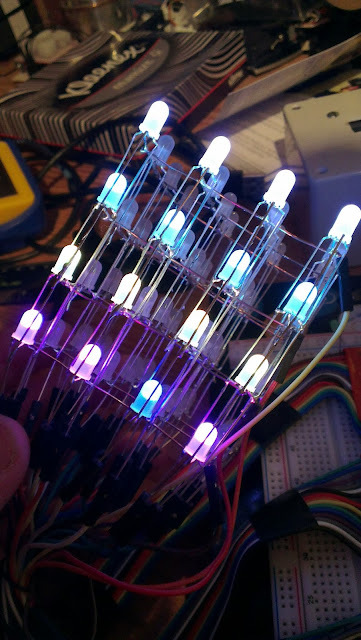 I now have control of all the LEDs individually as demonstrated in the picture, but now I have a new problem. I can run 1 slice of the cube (16 LEDs) on half brigtness but on full brightness or with more slices the program freezes. I have come to the conclusion the power surge cant disipate through the thin prototyping wires so the next stage will be to put it on some copper clad board and try again.